I served this salad yesterday at a luncheon with girlfriends. 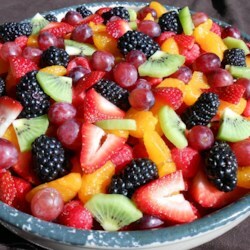 It was the most beautiful, delicious fruit salad I have ever served. I followed the recipe exactly. I cut up all of the fruit the night before and made the sauce and poured over and let it marinate in the fridge overnight. I added the bananas the following morning about 3 hours before my event. The fruit salad is absolutely bright and beautiful and it tasted so, so good. This is a keeper for sure and I recommend it to all of you!!!!! PERFECT in every way.